Join us in Dallas for the 2018 Hot Firm + A/E Industry Awards Conference. Come network, gain knowledge, and celebrate with the top firms in the industry. The 2018 Zweig Group Hot Firm + A/E Industry Awards Conference is the industry’s largest and most comprehensive business conference for leaders and aspiring leaders of AEC firms in the U.S. The conference agenda includes topics on technology, leadership challenges, business planning, marketing methods, recruiting and retention, and growth strategies. The success stories of Zweig Group award winners will be shared at the event, along with a variety of speakers from a range of industries, all guaranteed to challenge and inspire you to achieve even greater success. 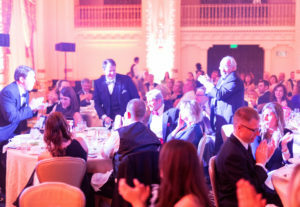 The conference will culminate with a black-tie awards banquet and ceremony where awards will be presented to firms on the 2018 Hot Firm List, the 2018 Best Firms To Work For ranking, the Zweig Group 2018 Marketing Excellence Award winners, and the Jerry Allen Courage in Leadership Award winner. This is guaranteed to be an event unlike any you have ever attended before! Register For the Awards Here!